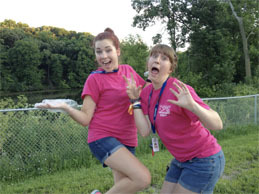 Download and complete a Volunteer Application and send to info@camphighhopes.com, or mail to Camp High Hopes – Volunteer Coordinator, 5804 Correctionville Road, Sioux City, IA 51106, or fax to 712-224-2269. Looking to get a little more information about how you can help out? Use the contacts below to reach out to our staff and get volunteering. As opportunities arise where your skills are needed, you will be promptly contacted.